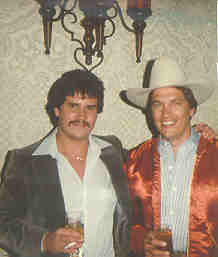 This picture of George and I was taken a pre-Houston Livestock Show and Rodeo performance. I believe it was about 1979 or so. This was at the Astrodome Marriott hotel ballroom. After rodeo parties were common in the late 70's and early 80's. About 1983 the record companies got tight and would not have parties, or they would be very small. Most of the Rodeo's parties I attended were at the Astro Village Hotel as it was called back then. Which now may be Sheraton Hotel. The top floor was a penthouse suite. It was shaped like a baseball diamond and the dance floor was a layout of a baseball field. One thing holding me back is a steadfast refusal to learn any one complete song. As a result, I end up singing the same musical phrases over and over and I must admit (though it pains me) even I get bored with my thwarted attempts at song making. I shudder to think what would happen if I actually ever stepped up to perform for a room full of people. They provide life insurance for just such occasions. But my own inability to remember songs has always spurred questions in my mind about real musicians, mainly how in God's name do they learn and have at their fingertips so many different numbers? There is no limit to my admiration for the musician who can ask an audience for a request, then actually perform a suggested song. In my opinion, this is the height of competence. Recently, I realized I had a lot of questions about the life of a musician, so I decided to go Strait to the source., none other than Mr. Show Business himself. Tom Foote one of my old high school friends who plays drums for one of this areas popular bands Ace in the Hole featuring George Strait. My intent was two-fold, to learn about and give Ace in the Hole some publicity and to determine what it's like to be a musician. Strait's name fits the man, for there isn't a straighter looking and shooting young musician in the business. Nor a more dedicated one. And he was letting the hammer down at the anniversary party, playing first on country song and then another as Ace in the Hole believers filled Finlay's dusty and ill-lighted dance floor wall to wall." Everyone is out of school except me and Mike Daily" Strait said. "I'll get out next semester, and I believe Mike will graduate after this semester. And then its music all the way." For those of you may not know them, Ace in the Hole does indeed feature "George Strait", who many regard as the finest singer to come out of this area in a long long time. Joining him are Ron Cable on lead guitar and vocals, Terry Hale bass and vocals, Mike Daily on steel guitar and of course Foote on drums. I'm no music critic but people like Kent Finlay, Cheatum Street Warehouse owner and fellow songwriter-musician consider them one of the best group of musicians in central Texas. They play country and western music with a heavy emphasis on Bob Wills type songs. Occasionally they slip into something like a Beatles song, but even these come out with a country beat. Frankly, I'm a city boy and have never taken that much interest in C/W sound. But frequently Cheatum Street the past few months has developed my taste to the point where I really enjoy listening to Ace in the Hole. Evidentially. I am not the only one-they've been drawing big crowds at the warehouse all summer long. I had the pleasure of meeting a partying with the likes of Charley Pride, The Judds, Conway Twitty, Merle Haggard, Moe Bandy, Mac Davis and Eddie Rabbit up there. 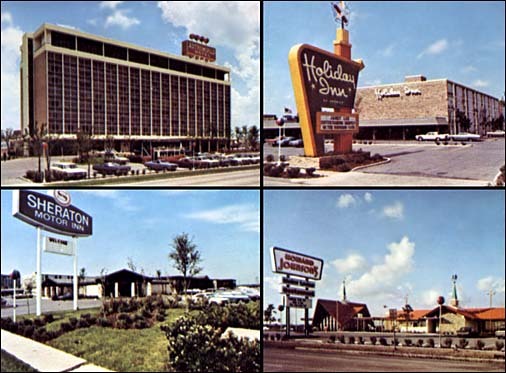 Click on the hotel picture to see some pictures from the old Astro Village parties. An Ace in the Hole performance is always marked by one overwhelming phenomenon-dancing. People love to dance to their music. According to Foote, in many of the clubs they play, dancing rather than applause is how the audience expresses it's appreciation for the quality of the performance. The key to the bands success in getting people on the dance floor is a combination of the music selected and the energy with which it is played. It also helps "that we truly enjoy what we are doing". Foote said. This feeling radiates from the band to the audience and tends to enhance the enjoyment of both. The fascination of women for male musicians is intriguing though somewhat baffling. Perhaps there is an emotional aspect of singing songs and playing music with feeling that attracts them. Or maybe it is the Hollywoodish promise of an exciting life amid big stars awaiting a lucky woman who hooks up with a musician. Or maybe it's just the beer and booze. I have always suspected that there is a aspect of power involved somewhere, but who knows. Anyway, Ace in the Hole has no plans to break up at this point, primarily because they sense growing momentum in their music. Finlay believes they will go on to do much bigger success and definitely predicts George will be a star on the national horizon. "He's the finest singer I have ever seen" Finlay said in a matter of fact voice. In the future, the band intends to start playing more original music written primarily by George and Ron. A recording contract, the goal of any serious group, may fall their way one of these days and they have already released a single record.